Insight on how producers find the day's top news stories. A lead story is today's news. Alright I admit it, that's a bit simple. A lead story is the news that people need to know now. When they turn on their TV screens what is the story that will be affecting the most people watching? What happened that changed to make it a "today" versus "yesterday" story? These are the questions producers need to be asking themselves when building their newscast. When it comes to choosing a story, I look for stories that affect the country, the Los Angeles community, or the latest information on a breaking news event. 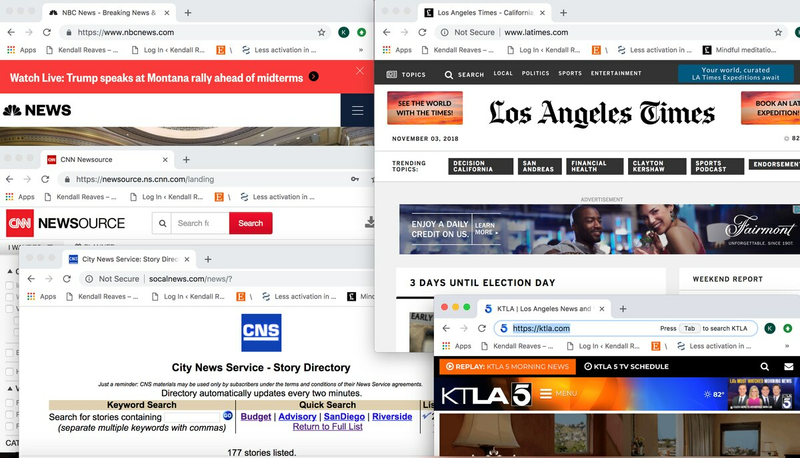 Scanning online current events and police wires, searching other news sites, and peeping in and out of other news shows throughout the day, I am always looking to see what stories most of these news outlets are all sharing on their different platforms. What is the news that is big enough that all stations want their viewers to know? No, news does not have an explicit expiration date, but news does fade. The beauty of producing a television news show is looking at your show as a blank canvas. You are in charge of featuring stories that will shape how your viewers see the day's news. Producers must understand they carry a large responsibility when choosing their lead story and others that follow. They have the power to bring to light a new perspective or outlook on the world through the news stories they choose and how they present them in their shows. As a teammate, I allow my lead producer the room to choose what she believes to be the most important story of the day. I try to take a step back as teammate to let Maddie, the lead producer, have the opportunity to create the show she believes would be most successful for the day of air. Yet, taking a step back does not mean I become voiceless; I always try to make sure she understands my perspective on stories I find important. If Maddie ever needs help, another angle, or another opinion on stories I always try to do what I can. The value of working with another producer allows for another voice and another opinion that may be completely different from yours. I appreciate working with Maddie and my executive producer, Nathan, and to hear as many different opinions as possible. Through hearing these multiple voices, you start to understand that news is not concrete, no one has exactly the same perspective, opinion, or set of values on any topic. The ability to be open and to see outside the lines is the ability to reach a higher potential as a producer of an informative newscast.